Okay, bear with me for a moment. I know that out of the four or so people who are going to read this half of you are exasperatedly sighing at the idea and the other half are at least raising an apprehensive eyebrow. But I was reading the book just the other day and it got me thinking about the prospect of having a videogame based on Fight Club (whether it carried the actual licence or not). 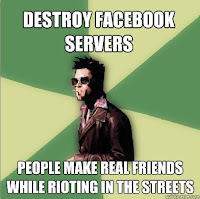 The main connection I made was that in Fight Club the members of project mayhem, through their fight club preparations and other various rituals, are taught to live without fear of death or consequence. And anyone who's ever played either Grand Theft Auto or Saints Row should know that this is inherently how you play through a fun sandbox game. So why not incorporate that fearlessness into the narrative and gameplay, rather than just letting it slide like every other game does? So now that we've established the idea let's get into the details. So it'll be a sandbox action game (it's not like it was going to be a JRPG) set in a New-York style city (again, not like it was going to be Azeroth). 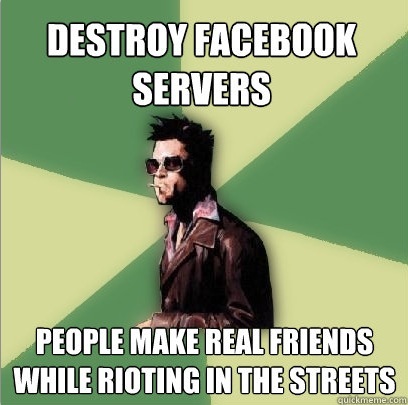 The player character would be the narrator of the story, Tyler Durden's right-hand-man-later-revealed-alter-ego. The first hour or so would probably be a play through of the character's boring, ordinary life (Everyday the Same Dream style) in which the players control would be restricted. When driving only a few roads would be open, only certain places accessible, few dialogue options, basic controls like punching don't work. However before too long (that bit really shouldn't drag out) we are introduced to Tyler Durden, and the fight club begins. The main entertainment value of the fight club sequences would probably just come from the spectacle of skinny businessmen in slacks beating the crap out of each other, but really we could just skip them and move straight to project mayhem (where the real fun is). The point at which project mayhem is established is where the game really starts to open up (symbolizing the player character throwing off the shackles of society, or whatever). Now you can drive along any road at whatever speed you want, say whatever you want and deck whatever random passerby you decide you don't like very much. Now the real fun is starting. Of course, the make-or-break element of a sandbox game is the missions. If those aren't any fun then the game will ultimately wind up being pretty dry overall (*cough* Mafia 2 *cough*) . But this is where i think the fight club premise will really shine through, as it allows for any number of crazy, havoc-causing missions without even needing an appropriate context. They're creating mayhem for its own sake, there's no explanation required. This is also what will set it apart from the other popular sandbox crime games that I mentioned previously. In those games there are story missions that actually progress the game, and side missions that earn the player some extra pocket money. But in this case the ultimate goal of both the story and the missions is to create mayhem, which means that every mission completed works towards the same goal as the story, giving the player more motivation to complete them. As for the missions themselves pretty much whatever can be imagined up would be fine (a few off the top of my head: Dirty Skywriting, destroying construction sites, encasing luxury cars in hot tar). Maybe we could play as different members of project mayhem for different missions, so we can hear some funny original dialogue between members. And so the more missions are completed the more messed up the city becomes when we're playing as mr. narrator in the open exploration bits between missions. Maybe when we've done enough missions we unlock special solo missions where we play as Tyler (though we would probably have to make room on the control scheme for a witty one-liner button). And if you've seen the film you know what happens, story progresses until we're sitting on top of a building waiting for the bombs to go off, waiting for society to fall. So that's my idea. I'm pretty sure this game is never going to get made (unless any of my readers has 10 million dollars and a few programmers lying around), but there's no harm in dreaming. But then, since this is an adaptation we could just assume that it would be a terrible game and move on with our lives.